Hello! Welcome to the 2018 KestrelCam season! We're back with an upgraded outside camera courtesy of Bosch, and streaming again on Youtube. If you notice a problem with streaming, try refreshing the page and restarting the streams. If you have technical issues or any other kind of issue, please use the contact staff link to get assistance. Please feel free to report any spam or disrespect to AKP staff. Remember to be respectful and courteous to other viewers, and enjoy the show! Click here to view this thread with the most recent comments on top! A male kestrel has been sleeping in the box each night. I have been watching our little male at dusk and notice the traffic on the other screen. Do you think the detours to and from the World Center for Birds of Prey will affect the lives of our Kestrels this year? The traffic hasn't seemed to bother the kestrels too much, but there are some nest boxes near the detour road, so hopefully the finding from those boxes will give us some answers as to your question! There have been papers published that notes that kestrels are usually highly tolerant towards disturbances. You can check out the article for more information by going to Research > Additional Kestrel Research. It is titled, "Effects of Researcher-Induced Disturbance on American Kestrels Breeding in Nest Boxes in Northwestern New Jersey." The AC unit going on and off on the roof doesn't seem to bother them and that's a lot closer than the road! Thank you for making this group! All alone again. Just the male. So sad. Empty nest syndrome. Such a handsome little male standing on the ledge above the cavity just before sunset. He preened for a few minutes and his head bobbed and then he flew off — probably didn’t want to turn in yet. Wish there were more signs of a hen hanging around. I notice the temperature is still just above freezing.... like that feature. Rather a patient bird, our hero. Poor thing. I hope he finds a girlfriend soon. The male entered the box about 10 minutes ago. Still before dusk. He’s looking up at the Cam, preening, trying to settle down, and meanwhile, some sparrows are twittering outside. Can’t a Raptor get some rest? Back to the cam to see if he can. Later, folks. The numbers that are seen at the bottom left side of the screen are not the temperature and wind statistics. It's actually getting quite warm here during the day here in Boise! Those numbers show what the angle of the outside camera is. If we were to rotate the camera around, those numbers would change. We apologize for any confusion! Thank you, Zoe! Appreciate the correction. It's finally getting warmer here too. You know, I wonder if the female has a lot more to do with the selection of kestrel real estate than the male. There must be hens in the vicinity, right? Do they settle down into a box only when they are due to start laying? I trust that it's not like peregrines who kill for a good nest site and are more attracted to the place than the mate. No male sleeping in the box for two days. so sad there isn't any action in the box this year. Maybe the male has given up on this box and found another site? On April 28/2018 Female Kestrel has laid her 2nd egg. All is well. Our HD LIVE STREAM will start on May 1/2018. 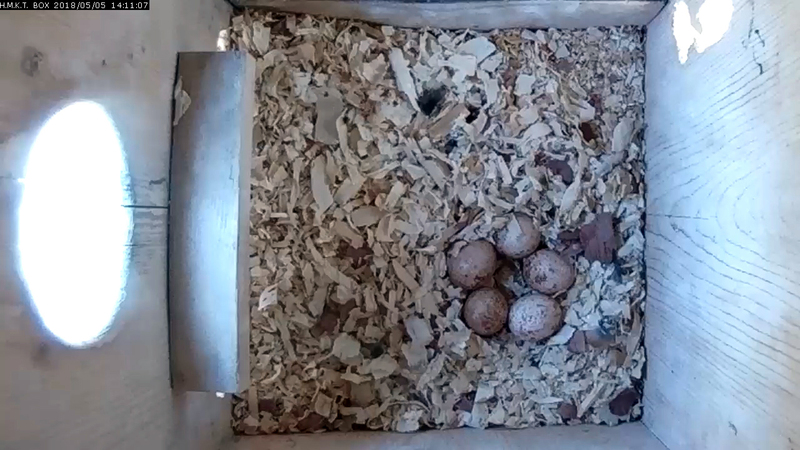 On April 30/2018 Female Kestrel has laid her 3rd egg. All is well. Our HD LIVE STREAM will start on May 1/2018. Hi all, Need a Kestrel fix. Hi all, Need a Kestrel fix. Our HD LIVE STREAM is now available. Link to http://www.nu-sun.com/ and follow the links. Hi, Nu-Sun! It is nice to know you are up there in Canada. I have taken a couple of peeks at the nest box; the hen stirred a little and got up for a moment about 10:00 last night. Also, a kestrel has been reported in downtown Minneapolis this week. Could be one of Kirby the Kestrel's descendants. Not giving up hope on there being something to see here on the AKP Kestrel Cam outside if not inside. Our live stream is now available link to http://www.nu-sun.com/ and follow the page links. Pretty little hen on duty. Pretty little hen on duty. AKP webcam sometimes shows birds flying by outside. Did they stop the webcam? So sorry there arn't any birds. Hi All! Back in April, we turned the camera on in anticipation of a nesting pair. As of yesterday (May 8), we still had no takers so we have turned the camera off to save on our IT staff time and resources. If we have late nesting birds, we'll be sure to go live again and send an update! Thanks for watching, everyone! Hi Sarah, That is unfortunate, but we can not control nature. For those who are truly interested our live stream is available link to http://www.nu-sun.com/ and follow the page links. Hi all, Our live stream is now available link to http://www.nu-sun.com/ and follow the page links. So sad no birds in the box this year. Is that attributed to anything in particular? Weather, construction, any local changes? Lots going on in our nest box !! Feel free to watch our HD LIVE STREAM link to http://www.nu-sun.com/ and follow the page links. Thank you, Nu-Sun Cinema Winnipeg, Manitoba, Canada. Thanks. I have been watching! 7:50 AM Minnesota/Manitoba time. The beautiful little male diligently sits on the family's clutch. It will be great to see the eggs hatch. Bees still bothering the Salt Lake Kestrel Kids today. Salt Lake Kestrel Kids all in their 'elegant' stage. Can't tell how many males and how many females yet though. Canadian nest box has the adult male on duty; eggs could hatch very soon. Hi, to all our American friends, have a GREAT MEMORIAL DAY! We are getting close to the hatch. Then the action will start. Link to our live stream at http://www.nu-sun.com/html/2018_report.html and thanks for watching. Nu-Sun Cinema Winnipeg, Manitoba, Canada. Hi all, 2 of 5 eggs hatched early this morning May 31/2018. First feeding was at 7:11 am. 3rd egg hatched 10:00am. Link to http://www.nu-sun.com/html/2018_report.html to watch. I saw the new Canadian Kestrel Kids being fed and the THIRD ONE hatching just now! I love it! Thank you! Hi to all, As of June 2/2018 5:29am all 5 eggs have hatched. Have a fantastic day, Nu-Sun Cinema Winnipeg, Manitoba, Canada. Posted in General Discussion by Administrator - The Peregrine Fund 1 year 1 week ago.